Brimbank Libraries catalogue › Details for: The #1 ketogenic diet + intermittent fasting beginner's guide and step-by-step 30-day meal plan How to Get Amazing and Proven Fat Burning Results by Intermittent Fasting on a Ketogenic Diet: Ketogenic Diet + Intermittent Fasting, #1. Details for: The #1 ketogenic diet + intermittent fasting beginner's guide and step-by-step 30-day meal plan How to Get Amazing and Proven Fat Burning Results by Intermittent Fasting on a Ketogenic Diet: Ketogenic Diet + Intermittent Fasting, #1. The #1 ketogenic diet + intermittent fasting beginner's guide and step-by-step 30-day meal plan [electronic resource] : How to Get Amazing and Proven Fat Burning Results by Intermittent Fasting on a Ketogenic Diet: Ketogenic Diet + Intermittent Fasting, #1. Mario Douglas. 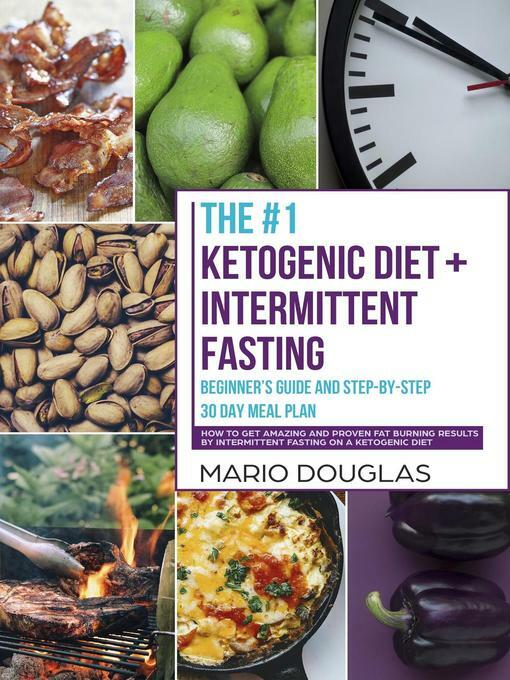 Material type: BookSeries: Ketogenic Diet + Intermittent Fasting.Publisher: Oklahoma City : Mario Douglas, 2018Description: 1 online resource.ISBN: 9781386827436 (electronic bk).Subject(s): Nonfiction | Health & FitnessGenre/Form: Electronic books.Online resources: Click to access digital title. | Excerpt Sample | Image Large cover image | Thumbnail Thumbnail cover image Summary: Combine the power of the Keto Diet and Intermittent Fasting for the most Aggressive Fat Loss of Your Life!The ketogenic diet and intermittent fasting are both wildly popular and equally effective dieting options. But, what happens when you combine the two? That is what this book will focus on, making it rather unique.Let&rsquo;s start by looking at what both keto and intermittent fasting are. It is important to understand them at their foundation because this will get you started in seeing how both can work well together. The next step is getting the basics about how each of these work to cause WEIGHT LOSS AND FAT BURNING. The next step is seeing how powerful the two will be together.In the first chapter, you will focus on INTERMITTENT FASTING.&nbsp;You will learn about the different methods, including the 16:8 technique which is among the most popular and flexible of choices. See why this type of diet works and why it is not like just any other diet on the market. There is a reason why people opt for intermittent fasting over traditional caloric restriction. In fact, this too has caloric restriction, but it happens in a way that is more natural and nearly effortless.The next chapter is all about the KETOGENIC DIET.&nbsp;Learn about how it works and what it does in the body. Get tips about making the transition and ensuring that you are getting the right amounts of macronutrients each day. This is imperative, but also quite easy. You will also get the facts about the two different types of carbohydrates. This allows you to make the best choices and it will also ensure that your lifestyle changes are as subtle as possible.Once you get to chapter three, you will start learning about WHY COMBINING THESE TWO DIETS IS THE BEST CHOICE FOR MAXIMUM WEIGHT AND FAT LOSS.&nbsp;You will see why they work together so well and get information about making the combined transition into each. Before you know it, you will be on your way to meeting your weight loss goals.The fourth chapter is YOUR 30-DAY MEAL PLAN and it allows you to take everything that you have learned and start applying it to doing a combination keto and IF diet. This is actually the fun part because it is where your journey officially begins. With the meal plan, you will learn why a meal plan is ideal and you will see that it can be flexible, making it ideal for anyone wanting to pursue it. You will get information about when to eat and direction concerning making the right food choices. You will also have a chart that you can use to track your calories and macronutrients.The final chapter will give you practical tips about following this combination diet, as well as weight loss and lifestyle changes in general. It ties everything together and gives you the information you need to be fully prepared to start this diet and find success with it. Combine the power of the Keto Diet and Intermittent Fasting for the most Aggressive Fat Loss of Your Life!The ketogenic diet and intermittent fasting are both wildly popular and equally effective dieting options. But, what happens when you combine the two? That is what this book will focus on, making it rather unique.Let&rsquo;s start by looking at what both keto and intermittent fasting are. It is important to understand them at their foundation because this will get you started in seeing how both can work well together. The next step is getting the basics about how each of these work to cause WEIGHT LOSS AND FAT BURNING. The next step is seeing how powerful the two will be together.In the first chapter, you will focus on INTERMITTENT FASTING.&nbsp;You will learn about the different methods, including the 16:8 technique which is among the most popular and flexible of choices. See why this type of diet works and why it is not like just any other diet on the market. There is a reason why people opt for intermittent fasting over traditional caloric restriction. In fact, this too has caloric restriction, but it happens in a way that is more natural and nearly effortless.The next chapter is all about the KETOGENIC DIET.&nbsp;Learn about how it works and what it does in the body. Get tips about making the transition and ensuring that you are getting the right amounts of macronutrients each day. This is imperative, but also quite easy. You will also get the facts about the two different types of carbohydrates. This allows you to make the best choices and it will also ensure that your lifestyle changes are as subtle as possible.Once you get to chapter three, you will start learning about WHY COMBINING THESE TWO DIETS IS THE BEST CHOICE FOR MAXIMUM WEIGHT AND FAT LOSS.&nbsp;You will see why they work together so well and get information about making the combined transition into each. Before you know it, you will be on your way to meeting your weight loss goals.The fourth chapter is YOUR 30-DAY MEAL PLAN and it allows you to take everything that you have learned and start applying it to doing a combination keto and IF diet. This is actually the fun part because it is where your journey officially begins. With the meal plan, you will learn why a meal plan is ideal and you will see that it can be flexible, making it ideal for anyone wanting to pursue it. You will get information about when to eat and direction concerning making the right food choices. You will also have a chart that you can use to track your calories and macronutrients.The final chapter will give you practical tips about following this combination diet, as well as weight loss and lifestyle changes in general. It ties everything together and gives you the information you need to be fully prepared to start this diet and find success with it.